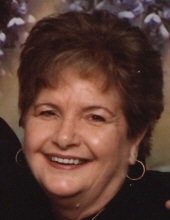 Gladys Christine Brookshire Warren, 78 of Rossville, GA., died Thursday, November 8, 2018. Gladys was a very active lady who worked as a Certified Nursing Assistant for many years, enjoyed cooking, making crafts, especially decorative Christmas balls each year. She was of the Church of God faith. Gladys was preceded in death by her parents, Robert and Rebecca Pace Brookshire; sister, Jean Coffman; grandson, Steve Lewis, Jr. Survivors include her husband of sixty-six years, Paul Warren; son, Paul (Donna) Warren, Jr., Chattanooga; daughters, Bobbie (David) DeBord, GA, Connie (Steve) Lewis, Pikeville; brother, Bob (Deb) Brookshire, Ohio; sister, Janice Dawson, AL; five grandchildren, Crystal Lewis, Tammie (Paul) Snider, Billy (Amanda) Poe, Brooke (Mark) Conner, Chris (Brandie) Warren; twelve great-grandchildren; 6 great-great-grandchildren; several nieces, nephews, cousins, and a host of friends. A celebration of life will be 2:00 pm CST Sunday, November 11, 2018 in the funeral home chapel with Bro. Donnie Lawson officiating. Burial will be in McDowell Cemetery. The family will receive friends 10:00 am-2:00 pm CST Sunday, November 11, 2018. "Email Address" would like to share the life celebration of Gladys Christine Warren. Click on the "link" to go to share a favorite memory or leave a condolence message for the family.